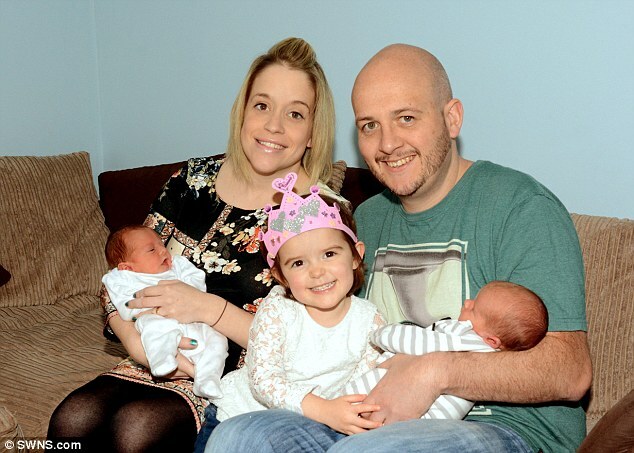 A married couple who thought they would never be able to have children are celebrating after welcoming triplets – born three years apart thanks to IVF. Denise and Glen Higgs, from Braunton, Devon, had all but lost hope that they would ever be able to conceive after Glen was made infertile due to cancer treatment. But using his frozen sperm, doctors successfully created eight embryos through IVF fertility treatment and the couple had a daughter Mazy, born three years ago. The couple tried again using the same batch and Denise gave birth to twins Carter and Carson last week. 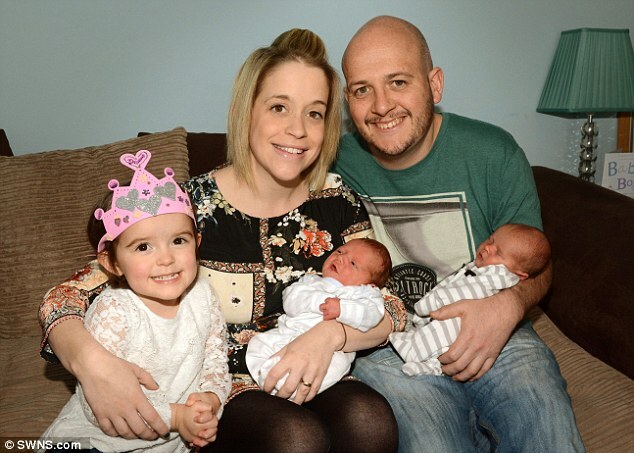 Former RAF fireman Glen said: ‘Medical staff have told us our three children are triplets as they are all from the batch of embryos that were created at the same time. Glen, 35, had always wanted to have children and decided to store sperm shortly before his testicular cancer treatment at the age of 20 made him infertile. He met Dee and, after living together for five years, tied the knot in 2011 before embarking on a course of IVF treatment. Glen said: ‘I had an unusual tumour growing within the testicle. After all my treatment, they tested my sperm and they were non-swimmers. ‘I knew then that if I ever wanted to have children I would have to go through IVF. Glen, now a manager at a filter-making factory, said: ‘We then just had to wait and see if it attaches okay. We ended up having eight embryos. ‘We put two in to attempt to have a child the first time and froze the other six. ‘We were talking about getting rid of them – as we were paying a yearly storage fee – but decided to try again. We had to fund it ourselves this time and put two in again. 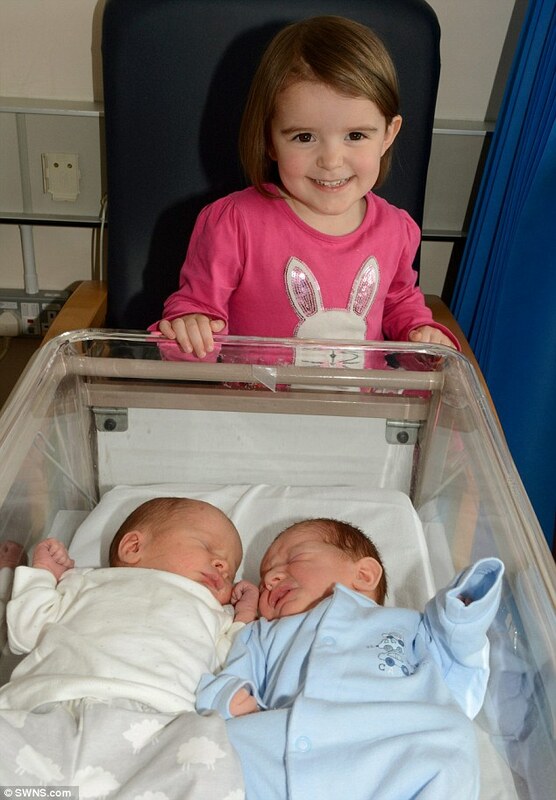 ‘Amazingly they both stuck and we have ended up with two more beautiful babies. ‘I always wanted to have kids and am a big family man. The process we went through was hard but we could not have asked more from the final outcome. ‘I am the happiest man ever. I have three healthy kids when I thought I would never have any. One we thought would be amazing – to have three is an unbelievable gift. The IVF procedure involved doctors effectively ‘hoovering’ the eggs from of Dee’s body and injecting them with the frozen sperm. Care assistant Denise, 27, said: ‘When I heard I was having twins I cried and my husband just went white. To now have triplets is simply amazing. ‘We were so happy though. It has been a huge change in our lives but we have just learnt to adapt. ‘Going through IVF is one of the hardest things you ever have to go through as a woman. ‘The whole process is horrendous, but as we have proved it does actually work. ‘There are so many injections and medication and it can be very undignified at times. I did get very emotional at times but I have no regrets at all about doing it. The couple have now disposed of the remaining embryos and have no plans to have any more children.